The hardship and trouble with which a woman surpasses all expectations in fulfilling the needs of a family is unimaginable. On this special day commemorating their existence, we at Read My Mind have tried to portray the initiative which has changed the way a man perceives a woman in India. To begin with, the case captures the strong presence of Self Help Groups (SHG‘s) which in the last decade has become the magic band for millions of rural woman across different geographies in India. SHG’s are small associations formed within a defined set of participants. Funds are initially raised through public borrowing and upon certain duration of maturity, yields surpass the rate of borrowing. The funds raised are collectively distributed among the participants of the SHG. Regular deposition of earned income into the associative banks allows the participant to enjoy savings. With a large rural population and untapped cultural and regional attributes, India is among the few countries in world to have a robust upside economy even in turbulent times as the Bubble burst of 2008. The Graph below estimates the No. 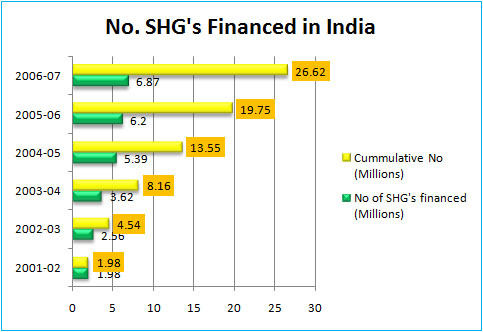 of SHG’s financed in India from 2001-2007. Source: National Bank for Rural Development (NABARD)- SHG, Bank Linkage Model. Reduction in levels of poverty with increased per capita income (Poverty alleviation). Asset creation at the bottom of societal hierarchy. Empowering woman with disposable income considering their better decision making abilities. Growth in literacy rate due to exposure to concepts otherwise alien among rural masses. Reduction in dependency upon informal money lenders. Over and above the mentioned factors, SHG’s have revolutionized the way businesses are operated at the grass root level. Advancement in technology and export oriented products have empowered the rural woman to not just become better home makers but has also garnished the prospective of becoming the sole bread winner of their kin. The concept of SHG derives its roots from Micro-finance or Micro-credit system hugely popular in Bangladesh. Given by the success of the Grameen Bank founded by Nobel Peace Laureate Muhammed Yunus, SHG’s have become an integral part of the ever changing rural population in India. The video below is an testament to the worthiness of one such SHG. Video Source: Adapted on the lines of Creating Happiness by Vedanta Group, the film is taken from the Creating Happiness Blog. You can view more videos related to empowering rural India, Literacy programs, basic healthcare initiatives, Mid-day meal program and special anganwadis working towards making India a better place to live among almost 65% of the 1.2 billion strong Indian population. However, no initiative is embroiled in the murky world of criticism and slapstick blame game. The uncanny operating procedure of such SHG’s are just a motive to suppress their existence. What happens behind closed doors of the policy makers is a question in argument. The circumstances of educated masses taking on a whole new dimension in their lifestyle is a concept better not to be ignored and supportive action combined with friendly, regulatory and policy initiatives is the need of hour.